Arbic, B.K., Savage, A., Alford, M.H., Buijsman, M.C., Farrar, J.T., Menemenlis, D., Richman, D.G., Shriver, J.F., Wallcraft, A.J., and Zamudio, L. (13-Dec-16). 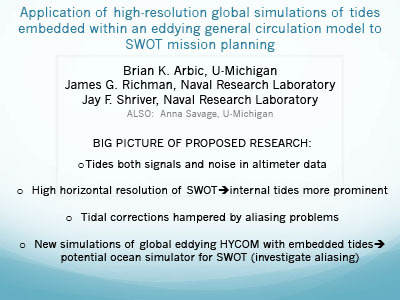 Because the SWOT mission will image sea surface height at unprecedented horizontal resolution, internal tides and supertidal internal gravity waves will be an important part of the SWOT signal, at the same time that they will be temporally aliased. 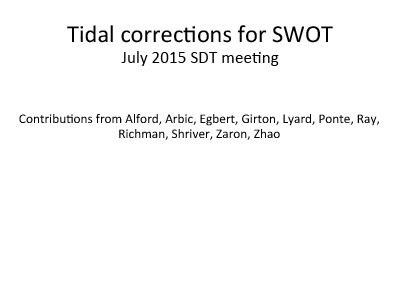 In this talk we will present some initial attempts to map the extent of the internal tide/wave problem. Farrar, T., Wang, J., Fu, L., Savage, A., and Arbic, B. (16-Jun-16). 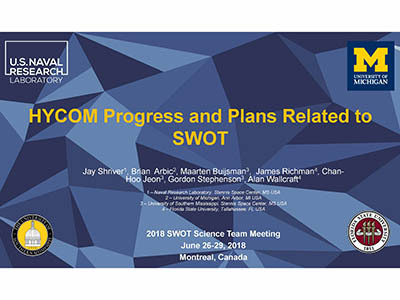 SWOT along-track sampling will be effectively synoptic. 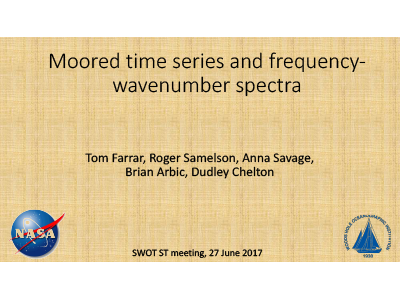 The along-track wavenumber spectrum needs to be validated. 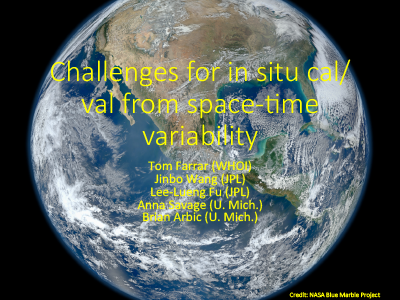 The high-frequency variability of the SSH field at small spatial scales (20-100km) will make it difficult to use some conventional in situ measurement approaches for cal/val - we will need some spatial arrays of instruments for synoptic sampling. View the animation embedded on Slide 7 of this presentation. Savage, A.C., Arbic, B.K., Alford, M.H., Ansong, J.K., Farrar, J.T., Menemenlis, D., O'Rourke, A.K., Richman, J.G., Shiriver, J.F., Voet, G., Wallcraft, A.J., Zamudio, L. (2017). 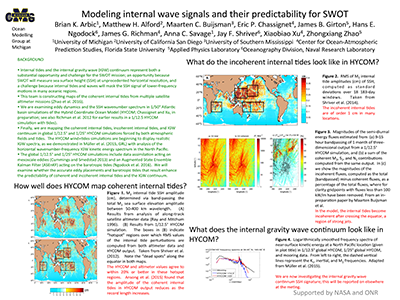 Spectral Decomposition of Internal Gravity Wave Sea Surface Height in Global Models, J. Geophys. Res-Oceans, 122(10), 7803-7821, doi: 10.1002/2017JC013009. Buijsman, M.C., Arbic, B.K., Richman, J.G., Shriver, J.F., Wallcraft, A.J., and Zamudio, L. (2017). 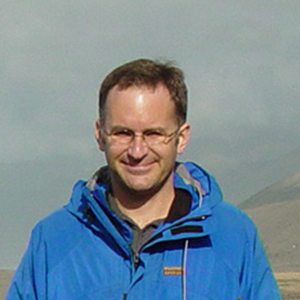 Semidiurnal Internal Tide Incoherence in The Equatorial Pacific, J. Geophys. Res-Oceans, 122(7), 5286-5305, doi: 10.1002/2016JC012590. Savage, A., Arbic, B., Richman, J.G., Shriver, J.F., Alford, M., Buijsman, M.C., Farrar, J.T., Sharma, H., Voet, G., Wallcraft, A., and Zamudio, L. (2017). Frequency Content of Sea Surface Height Variability from Internal Gravity Waves to Mesoscale Eddies, J. Geophys. Res., 122:3, 2519-2538, doi: 10.1002/2016JC012331. Ngodock, H.E., Souopgui, I., Wallcraft, A.J., Richman, J.G., Shriver, J.F., and Arbic, B.K. (2016). 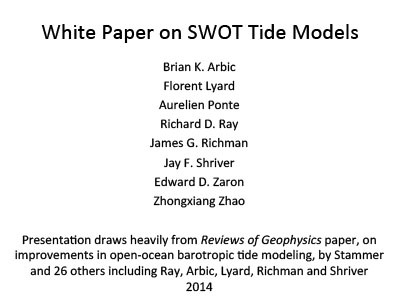 On Improving the Accuracy of the M2 Barotropic Tides Embedded in a High-Resolution Global Ocean Circulation Model, Ocean Model., 97, 16-26, doi: 10.1016/j.ocemod.2015.10.011. Ansong, J.K., Arbic, B.K., Buijsman, M.C., Richman, J.G., Shriver, J.F., and Wallcraft, A.J. (2015). 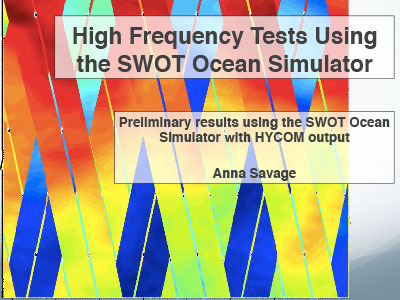 Indirect Evidence for Substantial Damping of Low-Mode Internal Tides in the Open Ocean, J. Geophys. 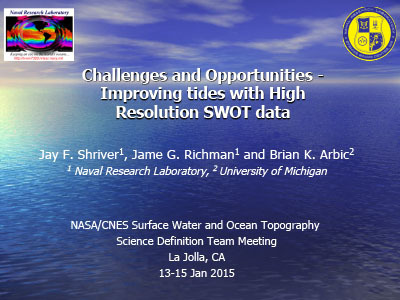 Res-Oceans, 120, 6057-6071, doi: 10.1002/2015JC010998. Müller, M., Arbic, B.K., Richman, J.G., Shriver, J.F., Kunze, E.L., Scott, R.B., Wallcraft, A.J., and Zamudio, L. (2015). 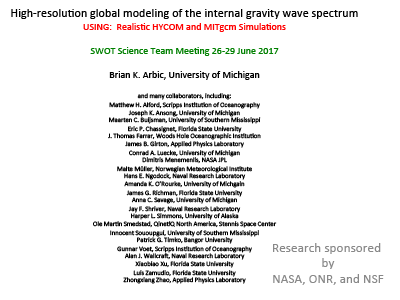 Toward an Internal Gravity Wave Spectrum in Global Ocean Models, Geophys. Res. Lett., 42(9), 3474-3481, doi: 10.1002/2015GL063365. Shriver, J.F., Richman, J.G., and Arbic, B.K. (2014). 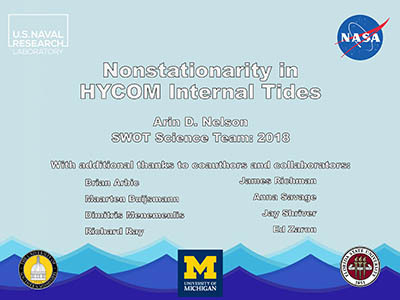 How Stationary are the Internal Tides in a High-Resolution Global Ocean Circulation Model?, J. Geophys.Res-Oceans, 119, 2769-2787, doi: 10.1002/2013JC009423. Arbic, B.K., Polzin, K.L., Scott, R.B., Richman, J.G., and Shriver, J.F. (2013). On Eddy Viscosity, Energy Cascades, and the Horizontal Resolution of Gridded Satellite Altimeter Products, J. Phys. Oceanogr., 43, 283-300, doi: 10.1175/JPO-D-11-0240.1. Richman, J.G., Arbic, B.K., Shriver, J.F., Metzger, E.J., and Wallcraft, A.J. (2012). 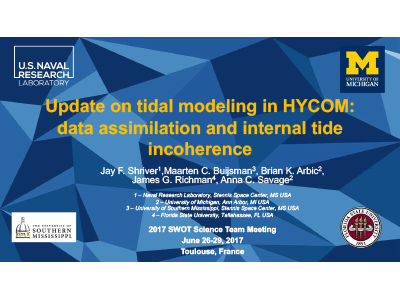 Inferring Dynamics from the Wavenumber Spectra of an Eddying Global Ocean Model with Embedded Tides, J. Geophys. Res., 117, C12012, doi: 10.1029/2012JC008364. Shriver, J.F., Arbic, B.K., Richman, J.G., Ray, R.D., Metzger, E.J., Wallcraft, A.J., and Timko, P.G. (2012). 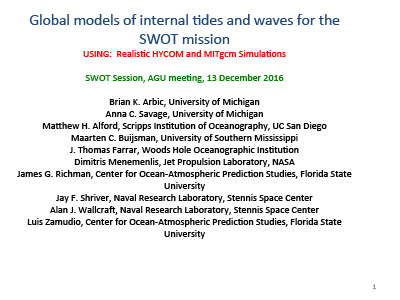 An Evaluation of the Barotropic and Internal Tides in a High Resolution Global Ocean Circulation Model, J. Geophys. Res., 117, C10024, doi: 10.1029/2012JC008170. Arbic, B.K., Richman, J.G., Shriver, J.F., Timko, P.G., Metzger, E.J., and Wallcraft, A.J. (2012). 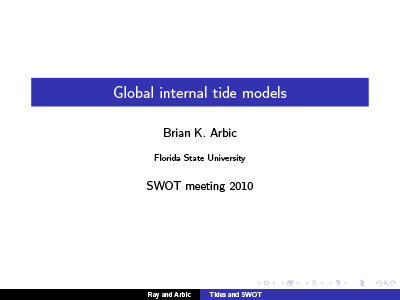 Global Modeling of Internal Tides Within an Eddying Ocean General Circulation Model, Oceanography, 25(2), 20-29, doi: 10.5670/oceanog.2012.38. Arbic, B.K., Scott, R.B., Chelton, D.B., Richman, J.G., and Shriver, J.F. (2012). 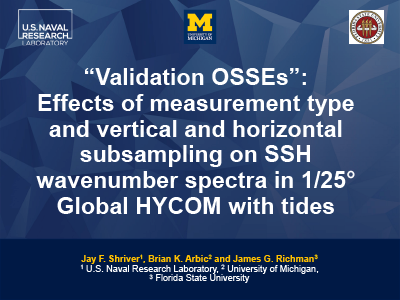 Effects of Stencil Width on Surface Ocean Geostrophic Velocity and Vorticity Estimation from Gridded Satellite Altimeter Data, J. Geophys. Res., 117, C03029, doi: 10.1029/2011JC007367. Arbic, B.K., Wallcraft, A.J., and Metzger, E.J. (2010). 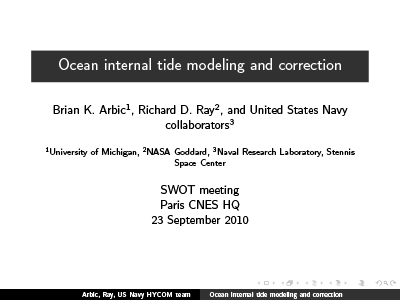 Concurrent Simulation of The Eddying General Circulation and Tides in a Global Ocean Model, Ocean Model., 32, 175-187, doi: 10.1016/j.ocemod.2010.01.007. Arbic, B.K., Garner, S.T., Hallberg, R.W., and Simmons, H.L. (2004). 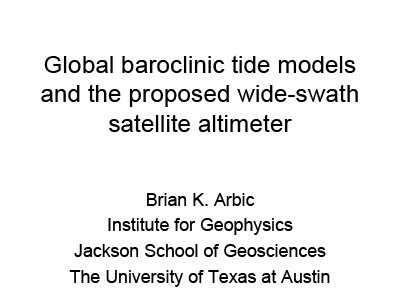 The Accuracy of Surface Elevations in Forward Global Barotropic and Baroclinic Tide Models, Deep-Sea Res. II, 51, 3069-3101, doi: 10.1016/j.dsr2.2004.09.014. Simmons, H.L., Hallberg, R.W., and Arbic, B.K. (2004). 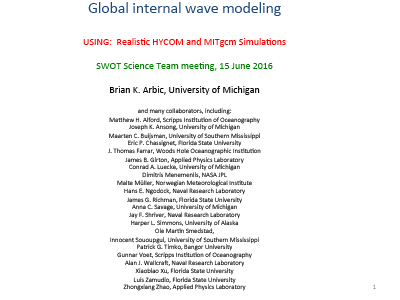 Internal Wave Generation in a Global Baroclinic Tide Model, Deep-Sea Res. Pt II, 51, 3043-3068, doi: 10.1016/j.dsr2.2004.09.015. PI: Brian Arbic (22-Jun-17). 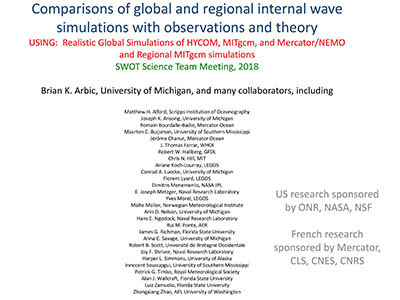 We are working with high-resolution global simulations, of the HYbrid Coordinate Ocean Model (HYCOM) and the MITgcm, that are simultaneously forced by atmospheric and oceanic fields and that therefore resolve both mesoscale eddies and internal wave motions.